Acarbose is part of alpha-glucosidase inhibitors (a class of medications) - which means that it prevents the body from efficiently processing carbohydrates which results in a much slower and smaller blood sugar release throughout the day. 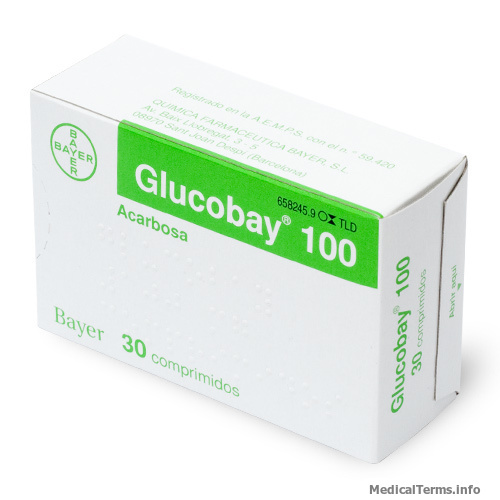 Acarbose is also a generic name for a drug called Glucobay (which when used together with dieting) can help lower blood sugar in patients who have Type 2 diabetes mellitus and unable to control the diabetes with diet alone. When diet together with Acarbose is still not enough to keep the blood sugar down to normal levels, it can be prescribed together with a sulfonylurea or with insulin. It is usually given in pill form. Acarbose is not meant to be used as a replacement for diet and exercise but as an addition to the two - and it is not intended to function by itself. Diet and a healthy lifestyle are still the best line of defense for the treatment of type 2 diabetes mellitus. In some severe cases where diet and healthy lifestyle is not sufficient to keep blood sugar levels down, Acarbose is prescribed as a secondary measure to assist the condition. Abdominal pains, diarrhea, and flatulence are the most common side effects of Acarbose. However, most studies show that these symptoms have a tendency to improve over time. For those who are not following a prescribed diet and yet continue to take Acarbose, the side effects will be worst. Other rare but serious side effects also include hives or skin rashes, loss of appetite or loss of weight, fatigue, and brownish or dark urine. You should have to let your doctor know if you have hiatal hernia, liver or kidney disease, stomach or bowel disorders, or any kind of allergies. Some types of drugs cannot be taken at the same time as Acarbose. These include thiazides or other diuretics, oral contraceptives, thyroid drugs. phenytoin, sympathomimetics, nicotinic acid, estrogens, calcium channel blockers, and isoniazid. If taken at the same time, you should carefully monitor your blood sugar so that it does go out of control. If you are taking sulfonylureas or insulin at the same time as Acarbose - you will discover that your blood sugar becomes too low which can lead to hypoglycemic shock in extreme cases. Studies have also shown that intestinal adsorbents such as charcoal may minimize the effect of Acarbose. Your doctor has the option to lessen your dose of digoxin if you are taking it along with Acarbose. The safety of taking Acarbose during pregnancy is not known in Pregnancy Category B. When tested on animals, the results have been largely safe but in the case of humans, it cannot be predicted - so, Acarbose should altogether be avoided in pregnancy. It is also not established whether Acarbose is safe in breast milk, but research show that it does not pass into the mother’s milk. Therefore, Acarbose can be be given to nursing women and children.